On March 29, 2014, we measured 20.8” (527mm) of SWE in our snow profile at the Hoosier Pass CODOS site (as seen in the photo above of Andrew Temple weighing one of eight continuous core samples of snowpack water content). No significant precipitation has fallen at the nearby Hoosier Snotel site since then. Our snow profile revealed the presence of dust event D3-WY2014 in a band located 6” below the snowpack surface, with 95% of the snowcover SWE lying beneath D3. Dust layer D3 was not apparent at the snow surface in the locale. Dust layer D2 was in an underlying ice layer. As of April 2, the Hoosier Snotel is reporting 122% of median Peak SWE, at 19.5”; the median date of Peak SWE is April 25. Overall, as of April 2, the combined South Platte River Basin Snotel network is reporting 115% of median Peak SWE, a few weeks in advance of the range of dates of Peak SWE in that basin. To the north, the Upper Colorado River Basin Snotel network is reporting an aggregate 117% of median Peak SWE, closer to the dates of Peak SWE in that watershed. Since our Hoosier Pass site visit, dust event D4-WY2014 fell onto the snowpack on March 30 with no significant snowfall covering it. Significant cold content remained in the snowpack in our snow profile at the high elevation site but exposure of layer D4 will accelerate the snowpack warming process toward isothermal temperatures (to 0.0° C throughout). Although the Blue River Near Dillon hydrograph reported normal levels, on April 1, streamflow may begin to surge in response to radiative forcing in dust layers D4 (and D3) leading to rapid snowpack warming at the lower margins of snowcover. Onset of snowmelt discharge will occur as and when D4 (merged with D3) emerge and remain exposed during predicted dry weather. In the South Platte basin, stream flow is not yet being reported at the Tarryall Creek Near Como gauge. At 173 cm (68.1”), this snow cover was second only, in depth, to spring 2011 at the Hoosier Pass CODOS site. This high elevation snowpack presented some evidence of recent surface melting episodes but scant percolation of free water. Snowpack temperatures in this profile were still cold with a mean snow temperature of -3.0° C; at the observed temperatures the snowpack was entirely ‘dry', with no moist (snowball snow) or wetter snow. CSAS field assistant Andrew Temple preparing the March 29 snow profile at the Hoosier Pass CODOS site. Dust layer D3-WY2014 was clearly visible in a diffuse band 8” below the snow surface. Dust layer D2 was present in a thin layer of ice just below D3. Dust layer D4 (March 30) fell onto the clean snow surface seen in this profile, significantly reducing snow albedo until fresh snowfall beginning today (April 2) began to bury D4. Once re-exposed, radiative forcing in layer D4 will need to melt almost 1” of SWE before merging with layer D3, reducing snow albedo even further. As of this writing, a few weeks in advance of median dates of Peak SWE, the South Platte River Basin Snotel network is reporting 115% of median Peak SWE. Somewhat closer to Peak SWE dates, the Upper Colorado River Basin Snotel network is reporting 117% of median Peak SWE. Within the framework of the “Snowmelt Runoff Scenarios” table above those SWE totals, as of April 1, place both watersheds marginally within the “High Peak SWE” domain. Current dust conditions, including event D4, could be characterized as “Moderate” or slightly worse and, should the recent rate of dust-on-snow events continue, dust intensity certainly could attain “Heavy” before the end of snow season. 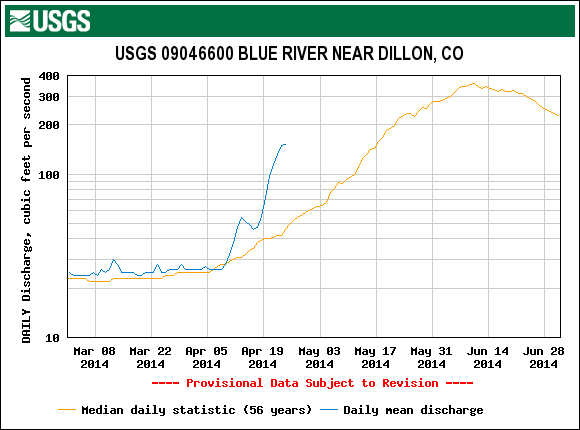 As of April 1 the comparatively high elevation snowcover in the Hoosier Pass locale appears to retains significant cold content and the Blue River Near Dillon hydrograph to-date shows no significant departure from median discharge levels, similar to the early flows seen in spring 2008, another heavy snowpack year. No data are yet available for Tarryall Creek Near Como flows. As always, spring weather will dictate the frequency and duration of dust exposure at the snowpack surface and the consequent impacts of reduced snow albedo on snowmelt runoff timing and rates. As of this writing (Wednesday, April 2) it is currently snowing and 4-8” of accumulation are expected throughout the Colorado mountains through Thursday, April 3, burying dust layer D4 with cleaner snow (which may include an additional, weak D5 event). Unsettled weather will ensue until a high pressure ridge develops to the west by the 8th or 9th. Given those forecasts, some delay may occur in the onset of Blue River and Tarryall Creek snowmelt runoff, from the median timing. Then, during the expected dry period, exposure of dust layer D4, and merger with D3, will accelerate snowpack warming at higher elevations where it is not yet near isothermal and tip the scale at the lowest elevation snowcover that was near-isothermal. Given average spring weather, with a few additional snowfalls in April and May, early runoff from the Hoosier Pass locale may resemble the ascending limb of the Blue River 2011 hydrograph shifted to the right, and the Tarryall Creek 2011 actual hydrograph, with erratic but strong surges to above-average peak flows, followed by sustained above-average flows. If April and May remain drier than average, with prolonged periods of sunny weather and persistently low snow albedo values, very high snowmelt rates may sustain that initial surging to well-above-average peak discharge at an even earlier-than-average date, as most of the snowpack is consumed. Flows could then follow closer to the median descending limb, as seen in the WY 2009 hydrographs on the Blue River and Tarryall Creek. See the Hoosier Pass CODOS Site Reference Page for site details and an archive of site-specific reports.